My conclusion was that these three elements define inquiry learning and separate it from related concepts such as information literacy. My choice of foregrounding these elements is based on my analysis of a wide range of literature advocating inquiry learning and my own philosophical stance. The literature includes curriculum frameworks, teacher handbooks, inquiry models and research studies. My philosophical stance is that inquiry learning pedagogy should incorporate the elements of everyday inquiry and workplace/community inquiry (i.e action research). Thus, it should be authentic, empowering and student directed. 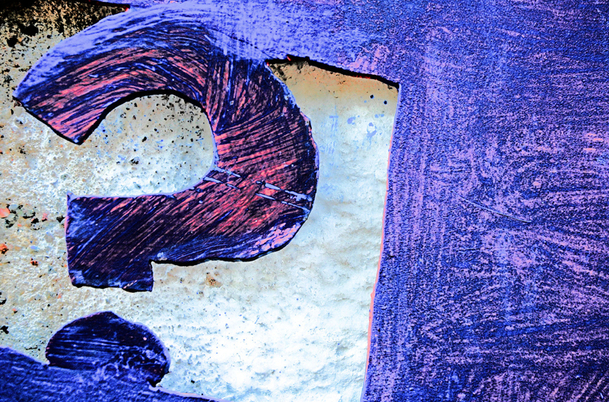 Inquiry learning involves explicitly asking questions. In planning an inquiry task or unit of work, the role of the teacher and student in asking questions is crucial. In some cases, the teacher many choose the general topic or overarching question, and then have the students pose a series of sub questions. This serves a dual purpose: 1) to narrow the topic so it is manageable, and 2) to allow students to follow their interests. The amount of student-led versus teacher-led questioning is related to the type of inquiry pedagogy that is followed. A structured inquiry is teacher-directed, a guided inquiry is a mix of teacher and student direction and an open inquiry is student-directed (Martin-Hansen 2002 ; Bell, Smetana and Binns 2005). What is our responsibility to those in trouble/less fortunate/less powerful? What makes a great person/leader? What is our proper relationship to nature? ‘In what ways does art reflect culture as well as shape it? What makes a mathematical argument convincing? How do our various body systems interact? How do authors use different story elements to establish mood? There are a number of inquiry and information process models that have questioning frameworks built into each stage of the model. Furthermore, each discipline has particular questions that guide the inquiry process, especially in relation to the ways in which information is evaluated. I will explain these in a future blog post devoted to questioning frameworks. The second element of inquiry learning is an information literacy or information seeking process. At the heart of inquiry is data collection and information gathering. There are a number of models that teachers may use used to scaffold this process. They all involve stages of seeking/gathering, selecting, evaluating, analysing, organising and presenting data and information. The models are variously called information seeking, information skills, information literacy, information process or inquiry process models. 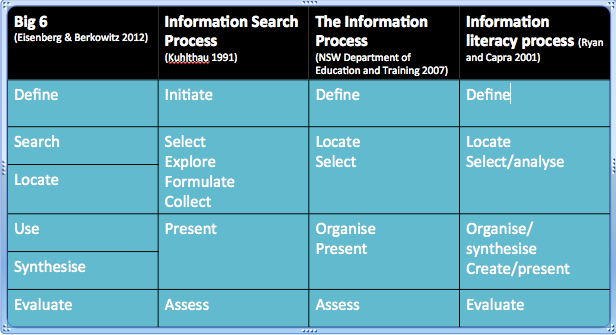 The Big 6 (Eisenberg and Berkowitz 1990 ; Eisenberg and Berkowitz 2012), Information Search Process (ISP) (Kuhlthau 1991 ; Kuhlthau, Maniotes and Caspari 2007), Information Process (NSW Department of Education and Training 2007) and Information Literacy Process (Ryan and Capra 2001) seem to be the most widely used models in Australia. As can be seen in the table they share similar steps. Taken alone, these models can be regarded as information literacy or information process models. When combined with questioning frameworks and an action research cycle, they become inquiry models. The third element of inquiry learning is an action research cycle. An action research cycle is based on the principle of continuous inquiry. That is, where one inquiry creates questions that leads to the next inquiry. This is seen in the questioning frameworks such as KWHLAQ which asks ‘What new questions do I have?’ The idea of action is also at its heart. In this case action can be the result of the inquiry (as in KWHLAQ which asks ‘What action will I take?’), or it can be the inquiry itself. Traditionally, an action research cycle includes a number of stages: planning, acting, observing and evaluating (McTaggart 1991). These stages are very similar to the process models described above. They involve defining the research question or problem, designing an intervention or solution, implementing it, gathering data and information, and evaluating the result. Action research is commonly used as a model for professional learning in organisations and community groups. Action research is ‘bottom up’ research that is undertaken by the practitioner, or person close to the research question, as opposed to ‘top down’ research undertaken by a company, government or consultant. Action research is regarded as a way of practitioners and community members taking ownership of the problem they have identified. It involves active participation in problem-solving and decision-making to improve practice. An essential component of action research is that it involves collaboration. Action research is not mentioned in the literature as being part of inquiry learning. However, I have chosen to foreground it here as a philosophical stance. I believe that we should regard inquiry learning in school and university as being a preparation for action research in professional and community contexts. In this way, we empower our students to become active participants in workplaces and communities. In terms of curriculum design, an action research cycle is similar to a spiral curriculum (Bruner 1963). With action research (i.e. inquiry), teachers and students can never say they have ‘done’ a topic (‘We did this topic last year, Miss!’). In a spiral curriculum, the same ‘topic’ is revisited at increasing levels of depth. Likewise, in an action research cycle, one cycle of inquiry raises new questions or problems, which leads to the next cycle. One of the problems I see with inquiry learning in schools is that it is often interpreted as a ‘unit of work’ where students undertake a discrete inquiry i.e. it has a defined end point. In higher education this is seen in particular ‘inquiry’ assignments or particular subjects in a degree being designed as ‘inquiry’ subjects. A more powerful model, I believe, is where the entire curriculum is inquiry-based. I acknowledge that it is idealistic of me to believe that continuous inquiry curriculum would be implemented at school and university level. This is because continuous inquiry (where one inquiry leads to the next) can lead in unanticipated directions, which is risky in an educational system that insists we predefine learning outcomes (Lupton 2012). However, I would argue that the inquiry pedagogy and models that we draw on should at least incorporate the ‘A’ and ‘Q’ of KWHLAQ. These models are what I call ‘holistic’ inquiry models. Holistic inquiry models incorporate a questioning framework, information literacy / information search process and an action research cycle. One such model is the Inquiry Circle (see image here). This model (Gourley 2008) is an amalgamation of three models from Murdoch (2005), Stripling (2003) and Branch and Oberg (2005). It is also clearly influenced by Kuhlthau (1991). The model comprises the stages 1) Tuning In 2) Finding Out 3) Sorting Out 4) Going Further 5) Making Conclusions 6) Taking Action, underpinned by Reflecting on Personal Understandings. At each stage there are a range of relevant questions that students use to guide their learning. This model is particularly appropriate for primary and secondary school inquiry, but could be adapted for use in higher education. I am lucky. I teach my Grade 8 Religion classes about Judaism and aspects of the faith tradition in the context of Jesus’ life and times, this continues to be embellished and built upon over subsequent untits in RE. I also take Religion and Ethics in Grades 11 and 12 and move the students past the dimensions of religion to consider the legacy. I hadn’t realised that my approach and that of the college aligned so closely with the holistic approach to inquiry learning. It will be interesting to do further reading and see what the alternatives are. Thank you for such a thought provoking post. I really enjoy your breakdown of inquiry learning here Mandy. As Head of Inquiry Learning at my School (North Brisbane) I found myself on a journey traversing the models of inquiry used (5E’s, QCAA Historical Inquiry & Scientific Inquiry) trying to bring staff to a common understanding of IL. Your breakdown of these three components is very useful in continue doing this. Earlier on in the year I used the Alberto model as a way to help staff get a sense of the ISP and role metacognition plays with limited success. In collaboration with our amazing teacher-librarian (who I am pretty sure has superpowers by the way, she is fabulous) we delivered PD using C. Kuhlthau’s GI. We have had some great stories of success (our PE department have grabbed GI with both hands and have done some amazing work with healthy lifestyles and safe choices). Great to hear of your approach, Des 🙂 Fantastic that you are Head of Inquiry Learning – what a great title, I’m so jealous! And yay for your teacher-librarian with superpowers! Feel free to get in touch anytime to talk – perhaps sometime I could visit your school sometime to see the work that you’re doing? Inquiry Learning in a nutshell, what do you think? Inquiry Learning is a process by which learners apply a dynamic sequence of thinking skills which engenders higher order thinking and contemporary learning dispositions. Hi Mandy, just wanted to share my recent experience with an inquiry based teaching model. A school I recently worked at has implement the PYP – Primary Years Planning – which is part of the International Baccalaureate (IB) program. It breaks the learning down into “units of inquiry,” such as “sharing the planet,” and then requires the students to undergo inquiry learning tasks. This has been a big change to the schooling methods. They are also basing their pedagogy off the Inquiry Circle and it definitely seems to be working. I really enjoyed my time teaching in this type of setting and hope that it becomes more and more common. Yep! It was a great experience and made it very easy to incorporate the Australian Curriculum into it.